Is there any truth behind the apple cider vinegar hype? Apple cider vinegar has been recommended for its health benefits for over 2000 years. These days there are claims that apple cider vinegar can clear your skin, kill warts, slim your waist and help regulate blood sugar. There is a reason why we include apple cider vinegar in so many of our Perfect Keto recipes — it works. A simple ingredient with tons of scientifically proven health benefits. Recent studies are showing ACV stands out because of its unique health benefits. A study released in 2015 showed that ACV antifungal properties against Candida[*]. An animal study published in January 2018 in the Journal of Medicinal Food found that ACV’s antioxidant effects reduced obesity-induced oxidative stress and lowered the risk of obesity-related health issues by way of reducing atherosclerotic risk[*]. A 2014 animal study published in the Journal of Membrane Biology found that ACV reduced oxidative damage and bolstered the levels of antioxidant enzymes and vitamins in the test subjects[*]. Apple cider vinegar is as simple as it gets and loaded with benefits. Once you learn how many different ways it can benefit your life you’ll be racing to the store to pick some up. As mentioned before apple cider vinegar has been around over 2000 years. Hippocrates mentioned in 400 B.C. He ‘prescribed’ apple cider vinegar mixed with honey as a treatment for the common cold. Apple cider vinegar is made from fermenting apples twice. The first fermentation produces hard apple cider – the kind of cider that’s not for kids. The hard cider is fermented again to produce apple cider vinegar. It’s this double fermentation process that creates a vinegar loaded with health benefits. When reading about or purchasing apple cider vinegar you’re going to come across the statement “with the mother.” The mother is a collection of healthy enzymes, bacteria, and yeast that accumulate during all that fermenting. You want the mother because that’s where the major health benefits are ACV are. In fact, you can increase the amount of mother in your jar by storing it where sunshine hits it. You will recognize the mother as the sediment or even strings that accumulate in apple cider vinegar. The double fermentation process that creates ACV involves bacteria devouring that sugar from the apples leaving behind zero carbs and a whole of health benefits. That’s a whole lot of zeros and may have you questioning what is in ACV, aside from a pop of potassium, that makes it so nutritious and healthful. Apple cider vinegar contains acetic and malic acids in it which are antimicrobial (meaning kills harmful bacteria and viruses) and antifungal (meaning kills fungi like those responsible for yeast and toenail infections). A word of caution before you go trying out every proposed ACV home remedy out there. Apple cider vinegar does NOT cure everything, is not a replacement for your healthcare provider’s advice. It is not to be used in place of your prescriptions. Don’t apply it to your skin full strength. ACV is acidic and can burn your skin. If this happens see a doctor for both the acid burn and the original concern you were trying to remedy. Apple cider vinegar may help with weight loss in a variety of ways. It can help regulate blood glucose levels which in turn helps prevent sugar cravings and energy dips that result in more carb cravings[*]. The healthy bacteria and enzymes in ACV can help get rid of Candida overgrowth. Candida is a type of yeast and when it’s growth isn’t checked by healthy bacteria can cause infections both on your body and in your body. Commonly we associated Candida with oral thrush and yeast infections, but it’s also the culprit behind many cases of obesity, fatigue, and sugar addiction. Its overgrowth is caused by chronic, excessive sugar consumption. A study just published in the January 2018 issue of Scientific Reports found that not only does ACV have an antimicrobial effect on Candida, but it also helps wipe out other pathogens like harmful bacteria Ecoli[*]. Apple cider vinegar has been shown in animal studies to also help mitigate the oxidative damage of obesity and even to increase other antioxidants and vitamins[*]. That same study found that ACV could help with lowering triglyceride levels, which are the fatty acids that easily become incorporated into LDL (bad) cholesterol and/or can accumulate as belly fat, especially in your waist. For all of these fabulous weight loss benefits to take place, you’ve got to add apple cider vinegar consumption to a healthy diet and lifestyle. The reasons that ACV can help with your overall weight loss efforts are the same reasons that it can support your heart health. Anything you can do to help prevent heart disease is a great investment in your health. ACV helps lower blood sugar, which reduces the amount of excess sugar floating around that would get enveloped into triglycerides, which in turn are enveloped into LDL cholesterol. Blood is essentially water with a bunch of awesome nutrients floating around to all the tissues in your body. When you’re dehydrated and/or when your blood sugar is increased, both of those things thicken your blood. Your heart has to pump hard in order to get thicker blood out to your body. Thus drinking 16 ounces of water plus 2 tablespoons of ACV is going help with both hydration and lowering blood sugar. That makes your blood easier to pump and heart disease harder to develop. It’s natural to feel a slight dip in energy a couple hours after lunch. If you’re not eating right and living a healthy lifestyle that slump is going to be even worse and come with major carb cravings. ACV’s blood glucose regulating benefits paired with the small bit of potassium content in apple cider vinegar can put some pep in your step when most are feeling sluggish. ACV contains 11 mg of potassium per tablespoon[*]. Putting 1 to 2 tablespoons of apple cider vinegar into a glass of water will give you the benefits of ACV plus hydration. This hack will only set you back about 25 cents and maybe 6 calories. That is far fewer calories than any energy drink out there. Used topically, at a dilution of 2 parts water 1 part apple cider vinegar, ACV’s antimicrobial benefits can help clear up your skin. In consuming ACV for all its other health benefits, it will also help clear up your skin. The healthier your digestive tract, the better hydrated you are and the more balanced your body’s pH is inside and out, the better your skin. To get the most out of ACV’s skin health potential, make it a consistent part of your beauty routine. Always make sure to dilute as ACV to prevent burning your skin. Wipe diluted ACV over your face, neck, and shoulders as a cleanser and toner. You can also add a cup to your bath water and enjoy a nice relaxing soak as the ACV balances your skin’s pH. If you’re dealing with a head cold or environmental/seasonal allergies, add 2 tablespoons of apple cider vinegar to a glass of water. While the water helps keep you hydrated and flushes out your body, the acetic acid and potassium in the ACV break up mucus. Apple cider vinegar’s antibacterial and antifungal properties can also help break down the very pathogens that are causing your cold and/or allergies plus help in preventing a sinus infection. 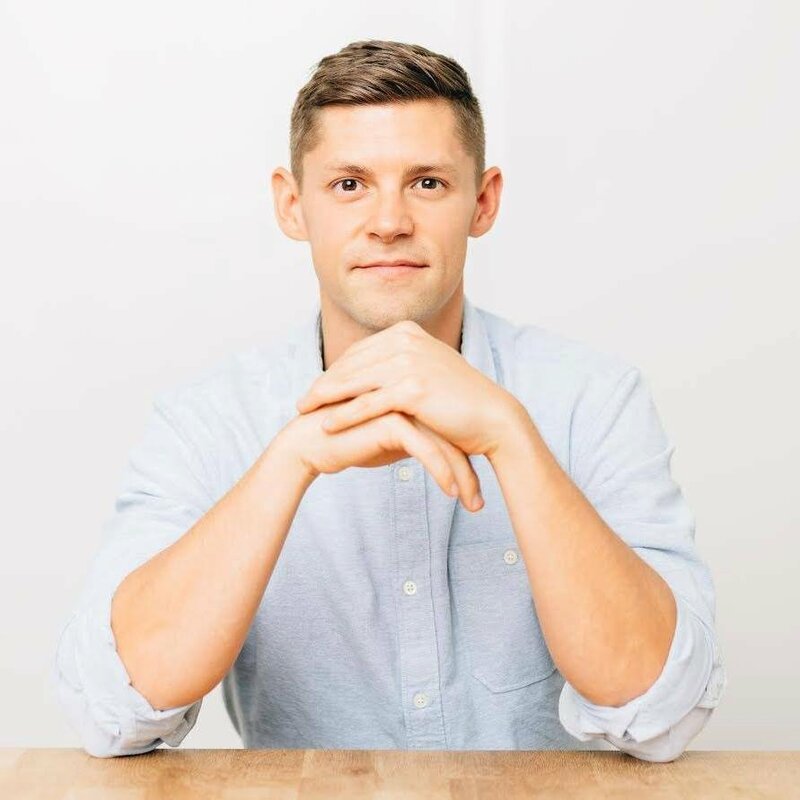 Sounds completely counterintuitive to drink acidic apple cider vinegar to decrease your heartburn, but many have found it to help tremendously. Some researchers and medical professionals speculate that the real reasoning for acid reflux is low acid. Acid reflux is when your lower esophageal sphincter (LES) doesn’t close properly and thus your stomach acid washes up into your esophagus causing burning and irritation. Scientists are beginning to think that the actual cue for your LES to close is your stomach acid. So if you have low stomach acid naturally, from stress, from dietary habits or from medications, then the LES wouldn’t get the signaling it needs[*]. Many swear that 2 tablespoons of apple cider vinegar helps in 8 ounces of water drank prior to eating a meal drastically improves their signs and symptoms of acid reflux. If any of these are missing the vinegar is great to clean your floors with but won’t help with the health benefits mentioned above. Bragg’s has been the most popular and common brand of apple cider vinegar for over 100 years and contains all those. Shake well each time to evenly disperse the mother and maximize the health benefits of every drop. Do not consume more than 8 ounces in a day, especially all at once. This can lower your potassium levels, which is dangerous for your heart. The sour taste of ACV alone, no matter how much you learn to love and crave it, will serve as an excellent deterrent from overconsumption. Because of its efficacy in lowering blood sugar levels, proceed with caution if you have diabetes — either type 1 or type 2 — hypoglycemia, hyperglycemia or some other condition that interferes with normal blood sugar regulation. Probably the easiest way to start incorporating ACV into your daily diet is to swap out gnarly store bought dressings for homemade dressings that your taste buds and body will love. 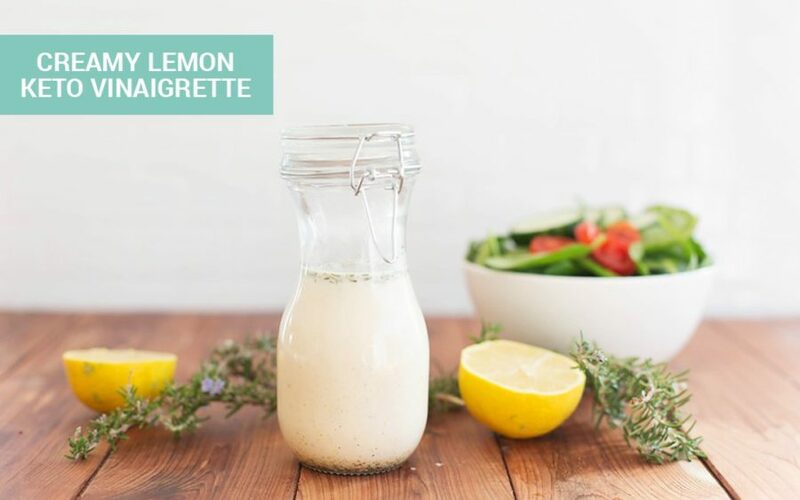 You must try this Creamy Lemon Vinaigrette. Click HERE to try this delicious dressing. Have your ketogenic diet and eat your pizza too. 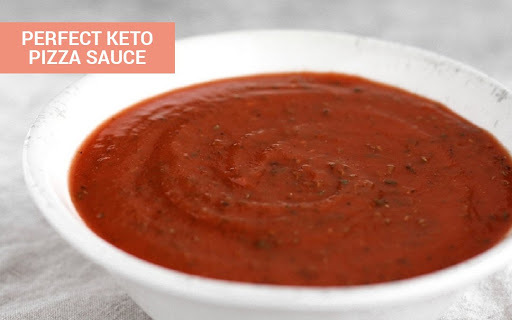 This Perfect Keto Pizza Sauce is step one of crafting your Perfect Keto Pizza. Stay keto, get your apple cider vinegar and get your pizza on. Click HERE to get sauced. Get your greens, ACV and your bacon all in one dish. 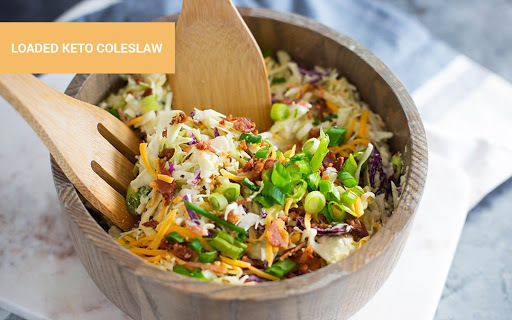 This Loaded Keto Coleslaw is absolutely delicious and will keep you keto. Get the recipe HERE. There are so many benefits of apple cider vinegar short-term, long-term and on the dinner table. Stock up and make sure to get a couple smaller bottles for your office drawer and on the go.